Mercedes-Benz says its new E class is the world's first car to be equipped with adaptive headlights that allow the driver to keep the high beams on at all times, automatically lowering the beams when another car is approaching. Hella KGaA Hueck & Co. supplies the optional system. It uses a windshield-mounted camera to view the road ahead and then passes the data to image-processing software. The high-beam assistant engages at speeds of more than 35 mph (56kph) and automatically dips headlamps within milliseconds should another vehicle be detected at a range of 800 meters or less. When the headlight is dipped, the illumination angle is adjusted to prevent the driver ahead from being dazzled while maintaining maximum road illumination. The low beam is regulated in a similar fashion. Rehau AG further improves the car's safety profile with bumpers that have integrated crash sensors. During a collision, data from the sensors triggers a mechanism to raise the engine hood a couple of centimeters, which reduces the impact experienced by a pedestrian. The E class has new four-cylinder engines that have higher outputs than the previous six-cylinder units. Mercedes says its strategy is to replace high-displacement, non-turbocharged engines with turbocharged engines with lower displacement to reduce weight, friction and fuel consumption. BorgWarner Turbo & Emissions Systems supplies a two-stage turbocharger for the E class's diesel engines. A key advantage of two-stage turbocharging is that it achieves high torque at very low revs but gives maximum output at high engine speeds. Delphi supplies direct-acting piezo injectors for the E-class's highest-performance diesel engines. Unlike conventional systems, the injector needles are operated directly by the piezo, enabling them to spray fuel into the combustion chamber faster and more accurately, thereby improving combustion and reducing emissions. The piezo injectors' direct action enables them to respond in nanoseconds to an electrical current. The E class may be equipped with an optional air suspension system, combined with an electronically controlled damping system. This system uses sensor data to regulate each wheel independently, improving ride comfort and handling. In addition, the settings allow the driver to switch between a comfort or sport mode. Vibracoustic GmbH supplies the air springs for the system while Wabco supplies its new-generation high-performance compressors. The E class has numerous interior refinements. For example, Draexlmaier Group Automotive supplies high-quality center consoles that have a stitched trim and are made from newly developed PVC sheet material as well as chrome and wooden fittings. Rieter Automotive Systems provides the vehicle's acoustic package, comprising more than 100 different parts to give sound damping and insulation. The E class is offered with a Harman Kardon sound system, tailored to acoustic conditions of the model variant. 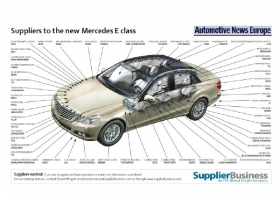 Mercedes builds E class in Sindelfingen, Germany. The E-class sedan was the first variant when it launched in March 2009, with prices starting from about €41,590. A coupe version followed soon after and a convertible is due in March.